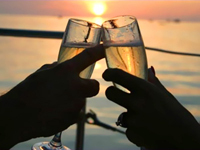 Hornblower Cruises provides fine fare, fabulous views and first-class service. Salty bay breezes, sparkling waves and matchless natural beauty make San Diego perfect for cruising. Hornblower guests enjoy gracious hospitality and impressive views of the Coronado Bridge, Cabrillo National Monument and playful California sea lions. The three-hour San Diego Dinner Cruise combines culinary excellence with unforgettable sights, music and dancing under the stars. Offered daily, this is the perfect option for relaxing on San Diego Bay or celebrating something special. The Dinner Cruise welcomes families and couples alike with warm hospitality, menu options and enhancements.